Poland is glad to announce an open call in long-term strategic EVS project “Happy Kids Better Europe 4” for 15 participants from Program Countries in 7 different Hosting Organizations (Kindergartens) from Wroclaw, Poland. Please read carefully the criteria below and send us the documents needed in case you want to apply. Eligibility: you are eligible to apply if you are 18 to 30 years old and if you have not done European Voluntary Service before. Eligibility: You are eligible to apply if you are aged 21 to 30 years old. We would like to recruit volunteers from: Russia, Italy, Lithuania, Spain, Hungary. The project will be implemented during next 2,5 years (01.02.2018 – 30.04.2020) in 16 different hosting organisations. Foundation will be the leader and coordinating organisation. – persons not appearing in the criminal record. • Food money: 400 PLN (prices in Poland: bread 1 euro, milk 0,75 euro per liter, sugar 0,75 euro per kilo, ice cream 1 scoop: 0,75 euro). What will you gain with this experience? – be more self-confident, responsible, mature. – during planned workshops and trainings develop solutions to support teachers’ cooperation and communication with volunteers, volunteers with children in an international environment. Develop a handbook of useful working methods together. Kindergarten No 49 called “Millennium” is the one of the oldest kindergarten in our city, because it is more than 60 years old. At first kindergarten was situated in Gliniana street but in 2000 we moved in to the bigger building in Borowska street. New building is situated near the Park Skowroni so there are a lot of trees. Our building consists of two flanks and they have got names: Legends of Wroclaw and Wroclaw’s gnomes. In the middle of two flanks is big area where we have got musical instruments and professional sport equipment. Since 2015 we have got new playground. Kindergarten has also its own logo.Today in our kindergarten there are 7 groups. They don’t have names but only numbers. Groups 2,3 and 4 are 3 years old children, groups 5 and 6 are 4 years old children and groups 1 and 7 are 5 years old children. In each group are working two teachers and caretaker. With 3 years old children besides teachers and caretaker are working teachers help.Our teachers have got professional qualifications and they have warrant to working with children in preschool education. Despite their professional qualifications they still to advance their skills in some courses. In our work we usually use many methods of education, f.e. : Pedagogy of Klanza, Method of Developing Active of Weronika Sherbone, Education through movement of Dorota Dziamska, Dennsion’s Method and many other. Except teachers , In our kindergarten, We have specialists:- speech therapist who has got qualifications in neurologopedics;- psychologist;- pedagogue who has got qualifications to work with children with special educational needs;- psychotherapist;- religion teacher;- eurhythmics teacher;- choir teacher;- dance teacher. But most important thing is that we are the people with passion who like to work with children and we are open for new experiences.We often go outside to some educational activities, once a month we have a concert and we have got many programs and projects, f.e. : program of Health Education, “Kids of Wroclaw to conquer the world”, project “the Second Tamborrad of Wroclaw”. We have some extra activities in our kindergarten:- choir;- eurhythmics;- dance lessons;- speech therapy;- religion lessons;- physiotherapy exercises.Mission of our kindergarten is to create place where kids could advance in their education and they have opportunity to play, learn and grow to well-experienced person. “Na Misiowej Polanie” Preschool No. 104 was created on 1 September 2004 through connecting two neighbouring preschool units. Therefore, it is one of the biggest preschools in Wrocław – there are 10 groups of kids who stay, play and learn here – i.e. 250 kids. The preschool is an educational institution appointed to look after, raise and teach the youngest children. The main aims and tasks of the preschool are defined in the Syllabus Framework of Preschool Education, elaborated and issued by the Ministry of National Education.Our preschool gives children opportunities to play, learn and get to know knowledge about the world together in conditions that are safe, friendly and adjusted to the children’s needs. The children staying at our preschool are kids aged from 3 to 6. They stay in 10 age groups, each group includes 25 children.Younger children stay at building A of our preschool. These are the following groups: Skrzaty, Biedronki, Kubusie – three-year-old children, and Muminki, Żabki – four-year-old children.Older children play and learn in building B. We have the following groups there: Niedźwiadki, Delfinki – 4-5-year olds, Smerfy, Słoneczka, Ekoludki – 5-6-year olds.Each group not only has its own name, but also a logo, a group code and its own rituals. The preschool has its own logo and a flag. Qualified staff continuously broaden their knowledge and skills at different training programs, workshops and courses. All the teachers have completed the course in educational kinesiology, the course in the methods of play pedagogy KLANZA, methods of good start, methods of Batia Strauss, methods on Children’s Mathematics and many others. Thanks to this, they work with children implementing innovative solutions, which helps in developing the kids’ creativity and openness to the world and people. In our preschool, considerable attention is paid to early teaching of mathematics – our own program: “Being friendly with mathematics” is applied here, thanks to which children learn the rudiments of mathematics through playing. Significant attention is paid to dance and theatre education – we organize annual events for the whole city of Wrocław – Preschooler’s Dancing Festivity and a Review of Preschool Theatres. The preschool service people are open, like children and are eager to participate in the joint projects introduced. They provide teachers with their support in the teachers’ everyday activities and periodical events.We are proud of our joint work being appreciated by the children’s parents and the closest environment. It gives us a lot of motivation to take further efforts and improve our activities continuously. The main areas of the impact of our preschool:- making it possible for children to adapt in a peer’s group in an optimal way,- development of key skills,- developing the pupils’ creative potential,- shaping pro-ecological attitudes,- healthcare education- mathematics education;- dance and theatre education;- effective cooperation with parents.Additional activities:- speech-therapy- corrective gymnastics- religion lessons- dancing- English- eurhythmics- art / sculpture- arts and crafts. Kindergarten is an educational institution that operates developing, caring and educating activities. The main objectives of our work defines basis Preschool Education Program. Kindergarten provides children the opportunity to have fun and learn in safe and friendly conditions adapted to individual needs and abilities of children. For us, every child is unique. We create conditions for harmonious development, to be independent and open to new experiences. We ensure that our preschool child gets the key to acquire knowledge, creative exploration and inspiration into action. We belong to a nationwide network of Health Promoting Kindergartens. We realize our own programs: humanitarian education program “Dzieciaki dbają o zwierzaki” (“Kids care about animals”), health education program “Mali Kucharze” (“Little Chefs”), program of physical activity “Dzisiaj jesteśmy sportowcami, jutro będziemy mistrzami” (“Today we are athletes, tomorrow we will be champions”), pedagogical innovation “Świat dźwięków” (“World Sound”) using archaic Tibetan instruments. We use active methods of work e.g. research methods, experimental methods, Maria Montessori’s approach, Klanza method of fun and many others. We cooperate with institutions supporting the child’s development. We care about good relations with parents and the local community. Pupils of our kindergarten are children 3 -6 years old. In the nursery there are 5 groups of 25 children: Ladybugs, Bees, Sunshine, Butterflies and Little Ants. Each group has its own name in addition to the national anthem, the code group and intra-group rituals. Kindergarten has its own logo and anthem. Kindergarten No. 27 “Skrzaty” – “The Dwarfs” in Wrocław came into existence in 1946 in the building at Dembowskiego 37 Street in the district of Wrocław which is calling Biskupin.Biskupin was incorporated into the city in 1928. Until today photographs of buildings of pre-war Biskupin behaved. One from them is showing the sanatorium at Dembowskiego 37 Street (today’s building of the Kindergarten No. 27). Old bulding, with traditions but modern kindergarten. Constantly trainee and improving institution. Opened to world and people. Preparing children for taking the further learning and new challenges. The goals of of pre-school education are:-to create the family atmosphere. We cause that the child is feeling loved, accepted and happy.-to versatile, harmonious development of every child.-to equipe them with the knowledge and abilities according to the law in force and individual possibilities.-to care about the physical and psychological normal development.-to develope predispositions, interests and talents.-to propagate the healthier lifestyle, ecological conducts and the cultural identity.-to cooperate with the family house and the environment.First and foremost, our kindergarten provides children the opportunity to have common fun and learn in terms of safe, friendly and suited to their development needs. Our kindergarten is carrying out various educational programmes, compatible with the scope of the kindergarten i.e. the environmental education and action promoting health: healthy feeding, the conservation of nature, ecological conducts, the recycling and healthy and active spending the time in the bosom of nature.Pupils of our kindergarten are children aged 2,5-6 years. In kindegarten are 4 groups, three of them counts 25 children and one of them 17 children.Qualified staff constantly excelling and expanding knowledge in the various trainings, workshops, courses.Operating personnel are open, child-friendly and willing to participate in the implementation of joint projects. We are pleased that our work is appreciated by parents, brings a lot of joy to children, and us satisfaction and encouragement for further action. This is an English-speaking kindergarten, so communicative English (B1-B2) is required. Our organization is the Centre of European Co-operation, running a language kindergarten, primary school, and activities available for all the kids in the city. We invite people from different countries to eNTe, so the Polish kids could meet people with different backgrounds and cultures. Our aim is to teach Polish citizens another languages, cultures and to show people from abroad the culture and language of Poland. One of the main concepts of the place is a natural, situational study of the foreign language. Children learn communicative English just like their mother tongue. They do not learn any vocabulary or grammar, as they acquire the language unconsciously by listening and playing with it. Our educators introduce the English language in natural way, through entertainment, activities or communication. Primary aim of eNTe is not to learn foreign language but to prompt positive associations with it. The presence of foreign volunteers is one of the factors which motivates the kids to use the language. Our aim is to teach them how to solve problems on their own, how to be persistent and patient, which will lead them to the result: feeling of satisfaction of being independent. The pedagogical aspect implemented in eNTe is based on Euro-didactic approach and uses the philosophy Maria Montessori: relaxing activities, formation of self-reliance and responsibility for one’s own acts and decisions through ‘practical exercises of everyday life’ (applying to the plate, self-dressing, using the toilet, solving problems, democratic decision-making). We introduce developmental materials, verbal lessons and our most important principle is: ‘help me to do it myself’. We have also implemented model of the ‘oriented to the situation’, by Dr. Armin Krenz and Dr. Jurgen Zimmer. Each week a certain subject is picked up and most of the activities refer to this specific subject. The subject may be chosen by children or by teachers according to their observations. eNTe is an open educational centre, which aims to visit as many places as possible. We are not an isolated island, as every week we have long-distance trips, which is an excellent opportunity to discover and experience the world. Other weekly activities in eNTe:- Gymnastics- Dance- Music- Animals- Speech therapy- Chess The structure of the groups in eNTe refers to model of family: older children assume responsibility for the youngers. Older children may bring newly acquired skills into effect (e.g. tie shoes) by helping younger ones. Kids of our of kindergarten are aged 2,5- 5 years. At school we have two age groups, one is 6-9 and the other 9-12 years old. In kindergarten we have 4 different groups each one of them with its own name: Bees, Frogs, Ladybirds and Butterflies and school with one group named Monkeys. among all participants by allowing international contacts and active participation. 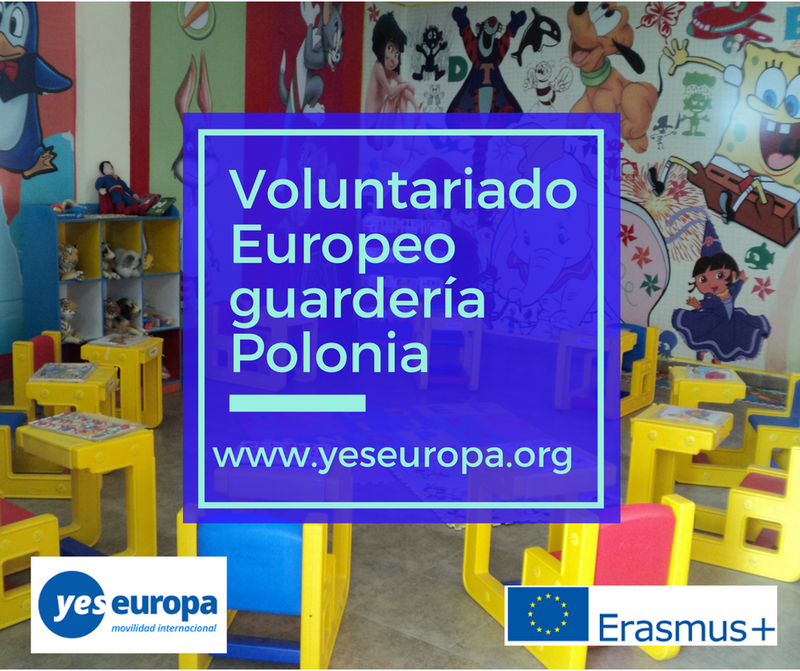 The overall objectives of the project has been implemented by meeting two volunteers from the Slovakia and Portugal in Wroclaw, Poland in public Kindergarten. This is a small intimate facility surrounded by beautiful old ‘Secret Garden’ enabling integration with the local community. Having lived under the same roof, living together stay in Poland, observing work of kindergarten teachers, learning, experiencing the differences and similarities, participating in training, running own classes they will develop a sense of solidarity and tolerance of what the new and different. Knowledge about themselves, other cultures and skills (linguistic, mathematical, social, civic, sense of initiative and entrepreneurship) that they gained will help strengthen their position in the labor market, active participation in society and to deepen mutual understanding among all project participants. For the project we have inviteed people willing to share their experiences and knowledge, interested in long-term work in a foreign country, who want to develop their language, intercultural skills and having a basic understanding of the needs and development of preschool children. The main topics of the project were: Creativity and culture; EU citizenship, European awareness and democracy. Volunteers were working in two groups of 50 preschool children aged 3 – 5 years. Four hours per week was devoted to Polish language classes. Methods that have been used in the project: workshops, observations, exchange views, multimedia presentations, team building, manual work, games, assume the active participation of volunteers. Fondation exists since 2004 and organized various activities of integration for locals of Psie Pole district in Wrocław, including: festivals, competitions, church choir, rallies, trips. Currently, the main action of Foundation is running the Ecological Kindergarten which is on educational institution where about 125 children attend this place. Our preschool pupils are children aged 2-6 years with 5-6 group of 25 children. In the Ecological Kindergarten we are fostering ecological attitudes among the youngest citizens alongside healthy lifestyles, respect for the environment, taking care of nature, curiosity and tolerance of other people and cultures. concern for health of children and encourage them to participate in sport, building children’s knowledge of the social, natural, technical world, develop ability to present their thoughts in an understandable way to others, introduce kids to the aesthetic values world and develop the skills to express themselves through music, drama and visual arts, forming in children a sense of social belonging (to the family, peer group and national community) and patriotic attitudes, provide children with better educational opportunities by supporting their curiosity, activity and self-reliance, as well as the development of knowledge and skills that are important in school education. Our kindergarten is a place of comprehensive capability development in children helped with: art classes, ceramics, design classes, chess, math, English, music and drama. We also have a large gym, which holds various sport activities and music for kids: football, tennis, taekwondo, zumba dance, general gymnastic, drama. Our preschool garden has an area of 7500 m2, beautifully covered with trees, with a playground, sledge hill and garden cultivated by children. In our kindergarten we also have a place for children with special educational and health requirements for example: chronically ill children, with Autism etc. We have room for sensory integration method exercises. After reading all the applications We will contact chosen candidates and arrange a Skype interview. You also might be asked to talk with kindergarten’s representative (eg to check your English level – when it’s required). After the full procedure We will make decision. This can take around 2 weeks. Final results will be known till 9th of February the latest. If you have any doubts do not hesitate to contact us. Our EVS coordinators are ready to answer your questions. Please, do not contact the HO directly, but us. Hola es solo para residentes legales en España, lo sentimos! Hola! En la descripción del proyecto se pueden ver diferentes guarderías cada una con sus características, me gustaría saber si hay que elegir una, si están todas disponibles y cuando comienza el voluntariado. puedes elegir varias, si no estuvieran disponibles, las borramos de la web, te esperamos! Hola! Y en cuanto a las fechas? hola me interesa mucho este SVE, pero trabajo en setiembre. Podria empezar en octubre? Hola, lo siento pero no, te enviamos por correo las plazas de octubre!